AMES, Iowa (AP) Iowa State’s rise to the top of the Big 12 standings has been one of the nation’s biggest surprises this fall. 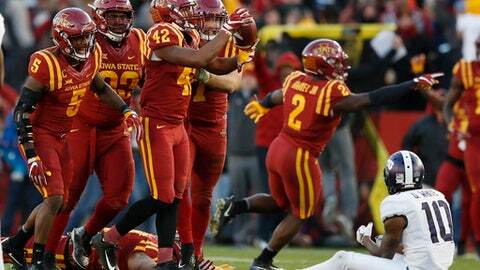 The Cyclones can thank their vastly improved defense. Iowa State has allowed just two offensive touchdowns- and one was by Texas Tech after the Red Raiders returned an interception to the Iowa State 7-yard line – in its last three games. TCU’s only points came on a kickoff return, which allowed the Cyclones to win despite being shut out in the second half. ”I was never worried about my defense. My defense always holds it down,” sophomore running back David Montgomery said. But the success of the unit hasn’t been a surprise for Campbell, who expected his linebackers to take a leap forward in 2017 – in part because he expected the linemen in front of them to improve as well.